Home sweet home! Conrad returned to his homeland after so many years. While he was away, the local lord gave a name to this region of Avalonia. They call it now Deep Garden, after the place is a bit under the sea level, and full with orchards. Conrad arrived at Rosebury, the biggest town in the region, where he and his father went on markets day. He left his followers here, and he went, to find his parents home. 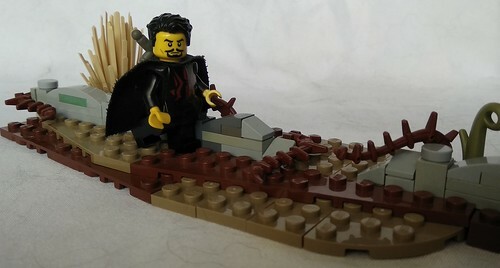 He found it, or at least the ruins of it. He didn't find anyone there, just a sole tombstone. So he went to the nearby farm, maybe, someone could explain what happened here. The neighbor was new too, he bought the farm from the previous owner, Conrad was glad, cause he used to steal apples from that neighbor. But, he wasn't so informative, he told Conrad what he knew about his family. Conrad was shocked, he blamed himself for he wasn't here, when the bandits attacked his home. But he quickly realized, he couldn't do anything to save his family, and it's sure, he would be dead too. He returned to Rosebury, to his men. They didn't go for the promised adventure, what Conrad told them. They spend the night here, Conrad wasn't able to sleep, many thoughts harassed him during the night. He felt bad, for what happened here, while he was away, but maybe this was his fate. Maybe every action what he made, lead him to this. Maybe it was the time, to show the world, what did he learn. The next day they armed themselves and rushed into the town hall. The mayor of the town become pale as snow when he saw the armed warriors walking inside in the room, demanding his presence. But Conrad quickly told him, what is this all about, and offered him his help. In the afternoon, all of Deep Garden knew about the new martial law, which was lead by Conrad. He promised, to take the position, as Protector of Deep Garden. He also promised, he would solve the bandit problem, and find a way, so Deep Garden can prosper again! And this is the end of Conrad's backstory. 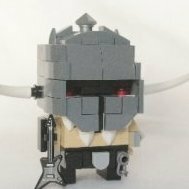 I really enjoyed the writing, the building, to show you guys, how did I imagine my sigfigs story, and how did he become part of Historica. It took longer than I expected, challenges, CCC, real-life things, but it is finally done! For my next builds and stories, now you know Conrad the Sly, but not yet know the stories of his closes friends: Zan, Lok, and Boris. They all have their little backstories, how they joined to Conrad's army. There will be more twists, more action, more dark humor, and of course, more Builds! Nice to see the backstory here. I like the story so far. The ground is interesting I like the use of the brown seaweed piece. Nice to hear that you will keep going! Pretty good work on the scene of a wall by the path, is his sword placed through his cape? Does that harm the cape? Nice epilogue. No, I don't think, it would harm the cape. 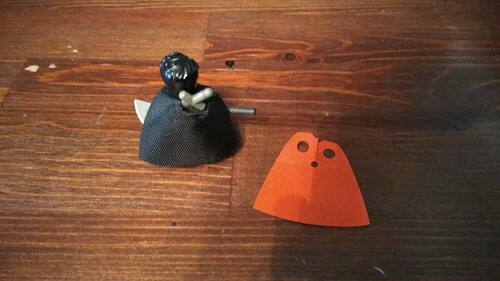 I use this a lot, put the cape on the figure, then simply put through the sword in the smaller hole. ... and a nice epilogue! It's nice to know how Conrad ended up back in Deep Gardens (and nice name choice + explanation for the city). Oh and there's one more thing: still a bit too many commas, but I feel like your stories flow better now. Not sure if you've made a progress there, or if it's me getting used to the way you used them No, seriously: I've been looking at them a little better and sometimes it looks as if you were using a German structure. Unfortunately, I don't know much about Hungarian, so I cannot tell you much more [I'm a language teacher and German is my 5th, so all this is kind of second nature for me and really cannot help it... I just find it interesting]. Whatever the case, I enjoyed reading your story more than in the past, which is the important thing, right? Looking foward for more! Thanks, @en_zoo. I find an app, it's Grammarly, it helps me, with the commas and words. Sadly, it doesn't help, with the structural order of the words. :S I'm sure, the problem is the Hungarian languages, I heard from many sources about how hard is. For being my native languages, I don't feel it hard, but it seems, it's hard to translate my Hungarian thoughts, to English. I stop many times, and start thinking over my story: "damn, is that correct?" But anyway, thanks, And I think it is you, who got used to my writings! :D But I'm also trying to be better. Also, Grover helped me out a few weeks ago. Good job getting the story told! The build itself is simple, but gets the job done. If I were to critique it, I would suggest that the ground would look better with smaller chunks of dark tan and brown to make it more uniform, rather than the large wedges of each.